Do you want to make cool games, impressive animations, andbecome an all-around Scratch super star? You've come to the rightplace! 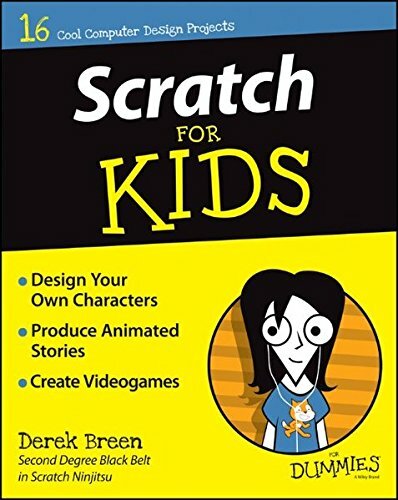 Packed with full-color photos and easy-to-followinstructions, Scratch For Kids For Dummies makes it easy toget started—even if you've never attempted computerprogramming or coding. Inside, you'll find out how to design anddevelop your own games, create amazing animations, interact withthe online Scratch community, and much more! There's no doubting that Scratch is fun, but it also helps youlearn to think creatively, reason symmetrically, and workcollaboratively—essential skills for life in the21st century. Best of all, the software is completelyfree and runs right in your web browser! With the help of thisdown-to-earth and friendly guide, you'll quickly discover how tochoose from a library of characters, backgrounds, and props, drawyour own options, and open another user's project, modify it, andpublish it online—all with the click of a button. If you're looking to make the most of MIT's Scratch software butdon't quite know where to start, everything you need to try yourhand at this popular multimedia programming tool is right here. Sowhat are you waiting for?